NYU Langone Medical Center has a heritage of greatness that is reinvented every day. NYU Medical takes deep pride in all that their exceptional faculty and staff have achieved for the benefit of their patients, students, community, and the world beyond. They prove, every day, that excellence is its own specialty. In their quest for uncompromising excellence, the Medical Center and their faculty and staff have received several distinguished awards. Learn more at: med.nyu.edu. NYU Medical needed to provide training to 8,000 employees on a new software application, the Integrated Clinical Information System (ICIS), which is used to maintain records for patient orders and documentation. 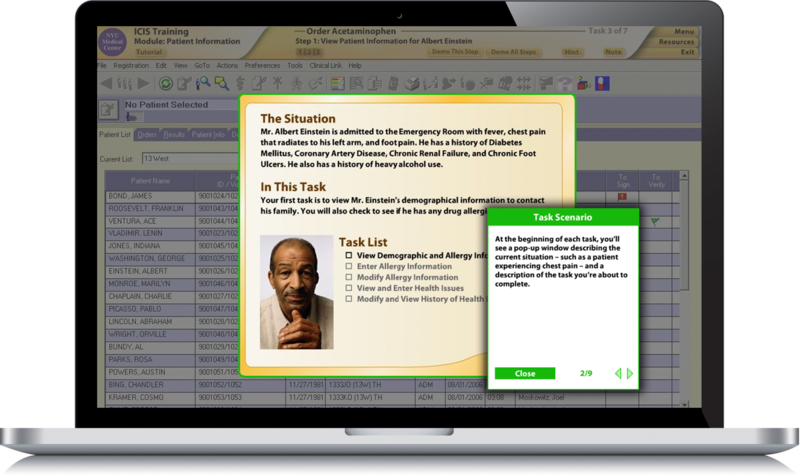 NYU Medical transitioned from paper-based tracking to entering information with ICIS. The heart of this interactive software training course revolves around a simulated environment of the ICIS software application where learners (NYU Medical employees) are presented with real-world patient scenarios and need to complete orders and tasks within the software application. The e-learning course contains eleven modules with scenarios customized for five user roles. Want to try out some of our e-learning courses? Access our demos now!